The Central State and Financial Plutocracy are bound in a mutually beneficial, highly predatory partnership. The Mainstream Media is missing the Big Story in the SEC/Goldman Sachs filing:the Central State needs the predatory "too big to fail" investment bankers to churn out the credit, leverage and insider deals the State needs to survive in an era of exponentially rising debt. There are adverse ethical and financial consequences of this partnership; in the short-term, the rot has been papered over, and simulacrum "reforms" to sooth public anger will be passed. But the partners each depend on the other for their very existence, and threatening one threatens both. I'm sad to say, I find myself agreeing with your comments about gaming the system becoming the system. The WSJ article you cited (An Economy of Liars) uses a libertarian argument to push for deregulation with enforcement of key staples/norms of capitalism. However, if enforcement is captured by the same forces that give rise to crony capitalism, which is an elephant in the room the current "reform" bill fails to address, neither regulation nor de-regulation will matter. Regulation will be ignored because there are no enforcements or consequences. De-regulation will only allow market mechanisms to be more distorted and shrouded. This is what people talk about when they say "regulatory capture." But when you have "capture of culture" so that norms are so skewed as to bail out the perfidious and punish the responsible, how can one expect healing and growth of the economy? That is what we have now, and taking a pain pill in the form of borrowing or lowering interest rates will not address the underlying disease. Indeed as with taking pain relievers to cover up the pains caused by a devastating disease, you will only ensure your demise. We require not only transparency and accountability but awareness and viable responses about what to do, not only with the fraud and its perpetrators, but the damage they have left in their wake once we turn up the rot. This is why no one seems interested in real investigation, enforcement, justice, fairness, or even free enterprise at all. They sense the rot and don't want to be pinned with cleaning it up once they are made aware. Our own landlords will not sign on for a free lead test for our house by the county with our two-year old in it, because if they knew, they would have to be responsible and disclose this fact to future renters. They simply will not agree to do it because short-term self-interest is more important than doing the right thing. Short-term self-interest, for them, has become the "right thing." The moral decay is evident, and that is what really makes your assessment uneasingly accurate. If there is one thing we have learned is that people without moral guidance will only see what they are incentivized to see in terms of their short term personal interest. Without a moral compass, short term, cannabalistic greed presides, and I have not known any economy to thrive on that premise for long. I don't know what form the downfall takes, but until we give a hoot about something greater than our personal fear and comfort we can assure that we keep falling. Thank you, Zeus. Next up, Harun I. who refers to this chart I recently posted, which shows total credit as a percentage of U.S. GDP exceeds the extremes of World war II. Your post and Mr. Hui's article are important indeed. ( Housing and the Collapse of Upward Mobility) But I couldn't help but wonder how people thought this would turn out? Did they really believe that coming out of college with a student loan the size of a mortgage for an education in basket weaving would leave them discretionary income or a balance sheet that was able to expand much further (I have a family member with $80,000 in student loans for a degree in journalism. She cannot afford the payments with her salary so what does she do? She defers the payments while she runs up more debt going to grad school! Insanity at its finest). Of course upward mobility is stunted proportionate to the level of debt carried, debt is a claim on future earnings. What did they think would happen when they bought into a monetary system that demands that future demand be brought forward on a compounding basis? Did they not understand that this must come at the expense of future generations? More to the point, in a sphere of finite resources, who thought or thinks that consumption at an exponential rate and therefore depletion at an exponential rate would leave room for future generations to keep consuming more? Only someone disconnected from reality could think this could continue indefinitely. But that is what mass manias and delusions are all about. Is it any wonder that the 1% are doing so well? They are the writers of the debt everyone else is buying...and we allow them to do this without a dime of their own capital. As an aside, I am completely confounded that the majority of the retail market buys options when over 80% of options expire worthless. Who do they think is writing the majority of those options? Institutions and the very wealthy are writing those options. And when those options even look like they may produce a loss for the writers the sheer power of their actions protecting those positions makes sure they expire worthless. But the public willingly continues to take the long odds. The masses keep buying the debt and the long odds, do not understand the rules of the game and wonder why they are losing. Buying a home does not make one wealthy because home equity does not really exist. All of this has been one grand illusion that has turned into a slow motion train wreck as it hits the immovable object of reality. How can it be that a home is the "middle class generator of wealth" when 66% of people retire into poverty and 65% of Americans are homeowners? I know of all the elegant equations but the simple fact is that they are not borne out in reality. If I sell a stock, bond, or commodity I can take that money and do as I please. I don't have to downsize my standard of living or borrow (encumber future earnings) to get at the equity in those instruments. A house is a peculiar beast in terms of "equity". It either has to be sold and its occupant goes to live in a much smaller dwelling in order to enjoy the "equity", or one must borrow (create a liability) to get at that "equity". Either way the standard of living will decline. Therefore, I find the notion of home "equity" quite absurd. People in general need to educate themselves on Present Value. They must understand its implications to what their money is worth now and at any point in the future. When they do, a much clearer picture will arise pertaining to debt, interest rates, inflation and "equity". I would like to see the "too big to fail" institutions fail but when the reality of what that means starts to impact pensions and 401K's, federal, state, and municipal income streams, and it is realized that the government cannot borrow enough to support a destitute population, I think the 99% will sing a different tune. The more I watch this debacle the more I am convinced that Cheney's "deficits don't matter" comment was not arrogance but candor based upon his understanding of the futility of the situation. It is essential (in a Ponzi scheme) that there be ever growing amounts of new capital to make payouts. Remember, not too long ago everyone was crooning about growth. Every fraud and swindle was counted as GDP growth, now we are beginning to realize that it was all one big fraud. Bernanke tells us point blank in his famous helicopter speech that he can "theoretically" make us spend by making it unprofitable to save. Greenspan spoke of the "global savings glut" that caused the bubbles. Pensions, 401K's, sovereign wealth funds are all pools of savings that had to be eaten to keep the debt as money scheme expanding. And with high quality risk exhausted there had to be a way to sell the low quality risk. If we want to understand, very clearly, the rise and fall of the middle class and how debt has affected this, all we need to do is look at the Credit Market Debt as a Percentage GDP you recently posted. The post WW II bull market that ended in 1968 occurred with very low debt levels and the middle class thrived. The 1982 -2000 bull market saw debt levels soar and the middle class lost ground (it took two incomes and high levels of debt to accomplish what once took one income and very low levels of debt). Two financial WMD's have gone off in less than a decade and from a logarithmic perspective it just looks like a mild consolidation when, in real terms, stocks and bonds have lost more than half their purchasing power and still are not at their historic relative lows. Structurally, debt is proportionately higher that at the start of the Great Depression and getting worse at an increasing rate, unemployment, if recorded properly would be exploding, and government spending (expanding debt) is the only driver of GDP. Fraud is now a way of life, it is SOP. There is not enough money in the hands of consumers to create the stupendous growth that is required by all the obligations (entitlements) that have been created. It is not a matter of desire, it is a matter of capability. We cannot produce and consume enough at a rate necessary to keep up with exponentially exploding entitlements. CDO and CDS, before they were given legal certainty in the CFMA of 2000, went from about $60 billion to over $600 trillion. Without this explosion of credit money system death would have occurred some time ago. We need the tremendous leverage that only Wall Street can create to keep from this farce from disintegrating rapidly. If not, we have what we have now: an exploding public balance sheet. In the post industrial age in a country that produces nothing but hands out entitlements to everybody how do you generate returns to satisfy this? Not only is GS necessary to maintain status quo but so are the rest of the TBTF banks. In the end this will fail spectacularly, it has already started. The end game is the Casino Economy where gaming the system is the way to produce returns needed (at least for a time) to maintain our illusory state. 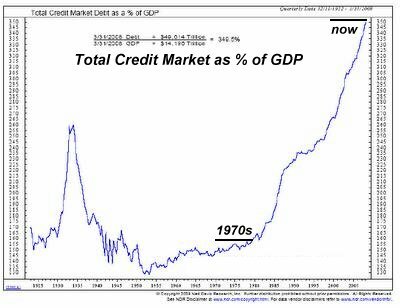 Just think, after the greatest credit expansion in history, we are still broke and continuing to lose ground. Thank you, Harun. 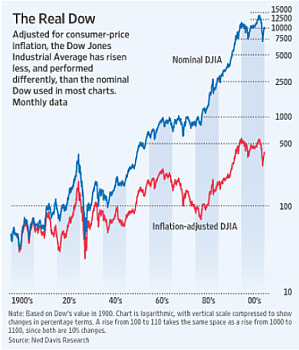 Here is a bonus chart of the inflation-adjusted Dow Jones Industrial Average, which shows the Bull Market of the last decade was as illusory as the "prosperity" built on the sand of home equity lines of credit and bogus mortgage-backed securities. Thank you, Andrew M. ($20), for your extremely generous contribution to the site. I am greatly honored by your support and readership. Thank you, John W. ($20), for your stupendous ongoing generosity to the site (from central China). I am greatly honored by your support and readership.